Get quality water for your business. Through ion exchange, Deionization gets rid of unwanted minerals in your water supply. Choose the Deionization System that gives you the level of purity you need. Culligan offers strong-base, weak-base, or mixed bed systems. We’ll help you determine which will deliver the quality of water your business needs. 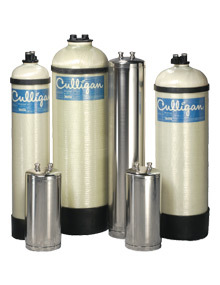 Culligan also offers specially engineered deionization systems for use on your commercial/industrial needs. 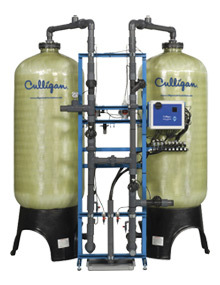 Culligan® Portable Exchange Deionizers (PEDI) are a part of a multiple process treatment system that produces high-purity water required for many specialized applications. Portable Exchange Deionizers from Culligan® is a safe, convenient and economical way to obtain consistent high-purity water from potable water sources. Our reliable PEDI systems consist of activated carbon and a selection of high quality ion exchange resins in portable exchange tanks. They connect directly to your tap water supply or for polishing to RO for high-purity water production. When the PEDI tanks are exhausted, a Culligan® service technician delivers, exchanges and maintains the equipment, thus providing continuous and uninterrupted supply of high-purity water to your operation. This system reduces capital investment, on-site labor, maintenance hassles or handling of hazardous regeneration chemicals and conserves you in water and energy resources. Culligan Premier Deionizers are part of a multiple process treatment system that produces high quality water required for specialized applications. Premier deionizers use ion exchange to reduce unwanted contaminants. Choose from a flexible configuration of weak base or strong base resin tanks. You also have the option to automatically or manually control the regeneration process. Culligan Premier Deionizers use fewer valves than competitors which helps improve reliability. A pumped regenerant system helps provide consistent regenerant usage.